This story was originally posted on texassharon.com. Happy Veteran’s Day to Leonard Popham who served in the U.S. Navy from 1969 to 1973, during the Vietnam War. To thank Popham for his service to our country, Pioneer Natural Resources has taken away his ability to earn a living on his own property. Pioneer staked out several acres of his property for two pad sites where they will drill six wells in the Eagle Ford Shale. Although Popham has seen nothing in writing, Pioneer has made a verbal offer that amounts to $.18 per day for the next 30 years. He has seen no surface lease agreement and has signed nothing. The only document he has seen from Pioneer is a restraining order that commands him to appear in court in mid-November. He does not yet have an attorney. After leaving the Navy, Popham worked as a park ranger for the National Park Service. Popham has a profound love of nature, the woods, wildlife and animals. He wanted a little piece of the American wild to call his own. For over 20 years, Popham lived a Spartan existence in a tiny travel trailer while he worked various construction jobs and saved every penny he could. He saved $200,000, met his wife Marie, and bought 200 beautiful, heavily wooded acres in Live Oak County. The mineral rights were not available for purchase but Popham was given verbal assurance that drilling would never happen on his property. Together the Pophams continued living the Spartan lifestyle, working hard to make improvements to their land while they lived in the travel trailer. In ten years time, they had completely paid for a home, the acreage and made many improvements. Their plan was to supplement their retirement income by raising horses, mules and cattle, leasing the land for grazing and leasing to hunters. Leasing grazing rights has brought in $150 per month. Deer hunters have offered as much as $7,000 per gun with the possibility of leasing to six hunters a year. They have sold several horses, mules and cattle. One bull recently brought around $1,500. The land is already leased for deer hunters this year but, it’s doubtful the hunters will see any wildlife to hunt once Pioneer begins their operations on Popham’s land. “In addition to loss of habitat, other potential direct impacts on wildlife from drilling in the Marcellus Shale include increased mortality . . . altered microclimates, and increased traffic, noise, lighting, and well flares.” The impact, according to the report, “may include a loss of genetic diversity, species isolation, population declines . . . increased predation, and an increase of invasive species.” The report concludes that because of fracking, there is “little to no place in the study areas where wildlife would not be impacted, [leading to] serious cascading ecological consequences.” The impact, of course, affects the quality of milk and meat production as animals drink and graze near areas that have been taken over by the natural gas industry. The senior veterinary toxicologist at Texas A&M wrote a letter of concern after looking at the air test results conducted on Deborah Rodger’ goat dairy concluding that the compounds were problematic to the animal’s health and to the food chain because these compounds are known to be ingested or inhaled and magnify up the food chain in milk and meat. Pioneer has stripped Popham’s ability to make a living on his own property. Pioneer Natural Resources has some core values listed on their website. They claim that to achieve their core values they must stay true to the following principles. We respect the individual, community and environment. We are ethical and honest in all of our business dealings. We are diligent in protecting the safety of our people and our environment. We are disciplined and personally accountable for our decisions, actions, attitude and results. We have an entrepreneur’s mindset, driving innovation and striving for excellence in all we do. We openly communicate among all levels and between departments and divisions. We believe in working as a team toward common objectives with a can-do attitude. Pioneer has verbally informed Popham that they plan to construct two 300+’ x 300+’ pad sites on this land. They plan to build a 400′ x 400′ unlined impoundment pit to hold their waste. The pit and its contents will be buried on the land. Drilling waste has been proven highly toxic and burying waste pits has been traced to many cases of groundwater contamination. In Pennsylvania 28 beef cattle were quarantined after exposure to drilling waste from an impoundment pit. The calves from those quarantined cows were born dead. This pit will be close to a running creek that feeds into Lake Canyon. They will doze tens of thousands of mature trees that provide cover and food for livestock and wildlife. Pioneer is a publicly traded company, NYSE:PXD. Pioneer’s net earnings for 2011 were $819.31M. Last year, Pioneer’s CEO, Scott D. Scheffield, made almost $10 million. See Source for more executive compensation information. The usual well performance and peak production of the top wells in the Eagle Ford Shale exceeded the best wells drilled in the Bakken Shale. If Pioneer drills six wells on Popham’s land, they will make a fortune while rendering his property useless to him. Pioneer could certainly afford to pay a fair price for Popham’s land and still make tens of millions in profit. Pioneer could stay true to their “fundamental principles” but apparently those words are meaningless. It’s a lot more profitable to slap a citizen with a restraining order and take their their land by force than to pay for it. On Veterans Day we honor the heros of the past and the present for their service. Leonard Popham served his country. He took personal responsibility, payed his own way and played by all the rules. Now he finds himself–like many others–in the middle of a sacrifice zone where American citizens–even honored vetrans–are sacrificed for energy extraction. Leonard Popham has nothing to lose. He will not go into that sacrifice zone quietly. He will continue sharing his story with us and sounding the alarm for others. 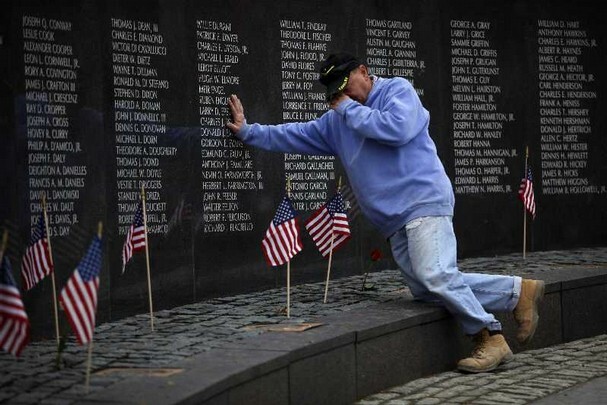 It’s easy to set aside one day a year to praise veterans. It’s harder to live the principles for which they sacrificed–freedom and liberty for all. We cannot continue to turn our backs on entire areas that are sacrificed to bring us cheap, dirty energy. We have to be better people than that. I know we can be better people than that. Founded by T. Boone Pickens. On the verge of bankruptcy in 1996, Mesa Petroleum was acquired by private equity firm Rainwater, Inc., which renamed the company Pioneer Natural Resources.